Cats are very curious and playful creatures, but when it’s time for their catnap, they’re dead serious about where they choose to snooze. If you own a cat, you already know that cats are amazingly intelligent, intuitive and independent creatures that become very important members of our families. 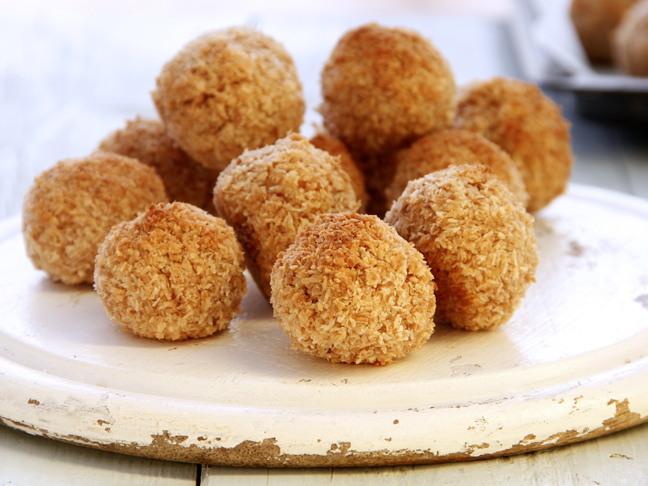 And as with any family member, we want to make sure they always feel safe and well cared for. So providing a safe and comfortable sleeping environment for them is a key part of satisfying these needs. So with all these ideas in mind, I set out to find some unique cat hideaways that your kitty will love, plus they’ll make great decorative accessories for your home too. 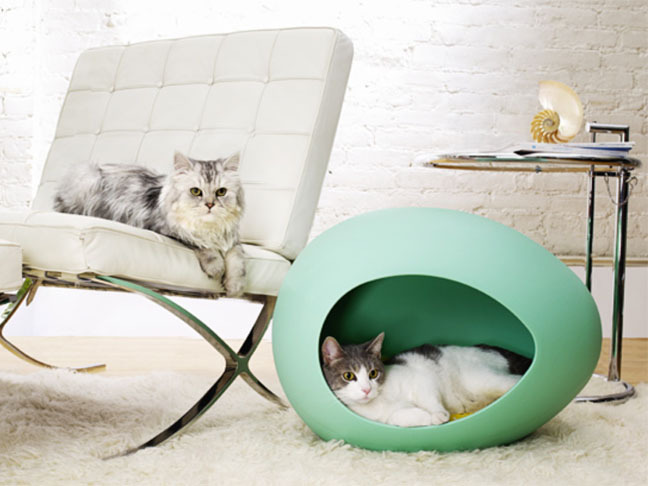 If your cat is more of the hipster type and your home has a contemporary or mid-century look, then this egg shaped cat retreat will be the perfect fit for everyone. These egg shaped pods are available in mint or pink and their interior polka dot patterned sleeping cushions are available in either pink or yellow. You can rest assured this personal cat condo will soon become a favorite retreat spot for your kitty. 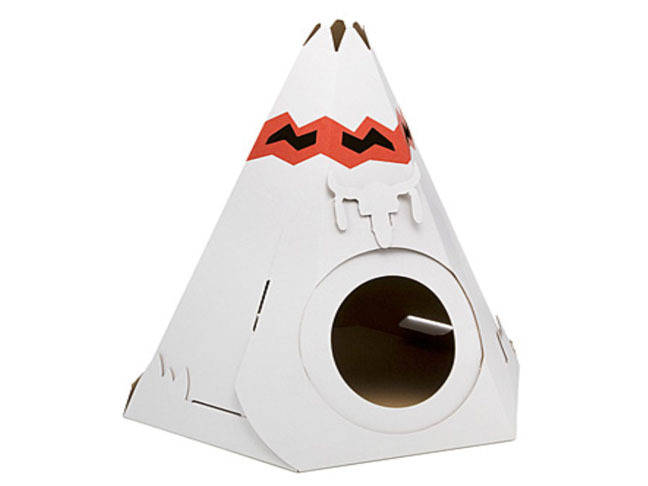 You don’t need to have Native American roots to appreciate how cool this cardboard cat teepee is and it’s a great conversation piece too. You’ll love it’s compact size, which makes it super easy to situate in almost any room without being underfoot. 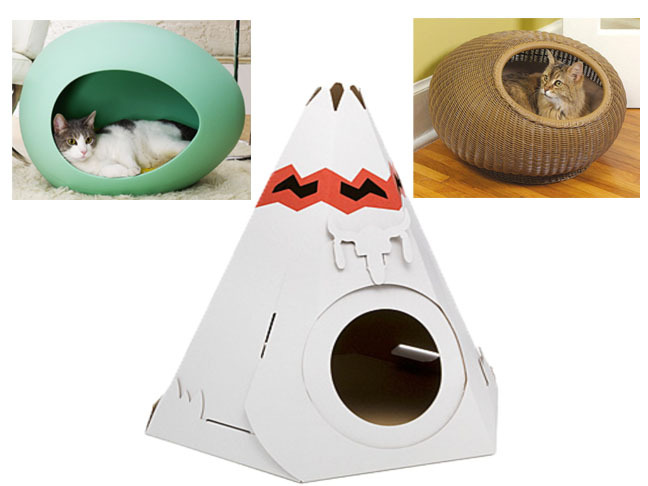 And even the most finicky feline will be happy to spend hours snoozing inside this unique cat hideaway. The decorative sphere shape of this Rhino-Wicker Cat’s Nest is not only visually appealing, but it will also snugly cradle your cat in both privacy and comfort. Plus it’s got an elevated airflow design, along with it’s reversible and machine washable microfiber suede cushion cover, that all work together perfectly to keep your kitty ultra cozy & happy.